The game is designed as an action-oriented alternative to other Infinity Engine games, with less emphasis on exploration and story. It uses a real-time adaptation of the Dungeons & Dragons (D&D) Third Edition ruleset. The Infinity Engine was modified to comply with the Third Edition, but the team was forced to remove certain rules because of the engine's outdated nature. It was the final game to be developed using the Infinity Engine. The game was well received by critics, who praised its combat, pacing, and use of the Third Edition rules. However, some reviewers felt that the graphics and engine had become outdated, and could not compete with its contemporaries. Icewind Dale II is a real-time adaptation of the D&D Third Edition ruleset. The game is viewed from an isometric perspective, and a head-up display (HUD) occupies the bottom of the screen. Accessible from the HUD are an automap and a journal that records quests and important events. The player uses a point-and-click interface to interact with the game; for example, clicking on the ground moves the selected player character, and clicking on a passive non-player character (NPC) will initiate dialogue. When conversations occur, the game presents multiple dialogue options. The game world is separated into area maps—obscured by fog of war—that are revealed as the area is explored. A multiplayer mode is available for up to six players over a local area network or the Internet. The "Heart of Fury" mode is also available, which increases the game's difficulty and contains more powerful items. The game features over seven hundred items; the designers included a system that randomizes the items the player obtains from enemies. Example of the main screen. When beginning the game, the player may choose to play a pre-selected party, or to create a party of up to six characters; unlike the Baldur's Gate series, Icewind Dale II does not permit the player to import characters from previous Icewind Dale games. While creating characters, the player chooses their gender, race, class, alignment, and attributes, among other things. The player can sometimes choose a subvariety of a race or class, such as Deep Gnome or Cleric of Ilmater. Race, alignment, and attributes affect the player character's available dialogue options, as well as NPC responses. For example, some NPCs will be prejudiced against certain races, or a character of low intelligence will have limited dialogue options. Some sub-races in the game are significantly more powerful than the core races present in D&D Third Edition; these sub-races must earn more experience points than others before leveling up. Characters can reach a maximum level of thirty. It is possible to add additional characters to the party at any time, including during combat. Icewind Dale II's gameplay is focused on combat. The combat system is a real-time adaptation of the turn-based system used in D&D Third Edition, which caused the developers to remove certain aspects, such as "attacks of opportunity". Dice rolls are simulated by the game. In place of the turn-based rounds used in D&D, characters have independent rounds, during which they may execute one or more actions, depending on such factors as the duration of the action. The player can pause the game and issue orders to characters at any time. Each character can carry a limited amount of items. Icewind Dale II takes place in the Forgotten Realms D&D campaign setting, on the continent of Faerûn. It centers on the northern Icewind Dale region, and is set thirty years after the original game. The game begins in the harbor town of Targos, one of the Ten Towns of Icewind Dale, which is under siege by a goblin army. The goblins are directed by the Legion of the Chimera, an army composed of outcast races and religious factions, such as goblinoids, half-breeds, and followers of winter goddess Auril. Targos hires mercenaries to defend against the attack. Areas encountered in the game include: the Black Raven Monastery, built over an entrance to the Underdark; the town of Kuldahar, constructed around a magical tree that emits heat; the Severed Hand, an ancient elven fortress that was lost during a war with goblinoids; and the Dragon's Eye, a network of volcanic caverns inhabited by yuan-ti. Other areas include the Underdark and the Jungles of Chult. The game begins as the player's group of mercenaries arrives by ship to defend Targos. They report to the town palisade and fend off an assault by the goblin army. Afterwards, the mayor of Targos orders them to start an offensive on the goblin army. The group kills the chieftain of the army, and discovers that he was under the command of a woman named Sherincal. When they return to Targos, the mayor asks them to rendezvous with reinforcements from Neverwinter. The group travels to meet them in an airship piloted by Oswald Fiddlebender. As the group travels to Kuldahar, they meet a drow (dark elf) named Nym, who tells them that the pass to Kuldahar is guarded by the Legion of the Chimera, and that an alternate path through the Underdark exists. Later, Isair and Madae locate the group with information from Nym. They state their intention to attack Kuldahar, and warn the group to not interfere. The group then passes through the Black Raven Monastery to enter the Underdark. After exiting the Underdark, they are flown to Kuldahar by Oswald Fiddlebender. During summer 2001, Black Isle Studios employed three development teams. These included the Icewind Dale team, the team developing Torn, and a team working on an unannounced project. Before and during Torn's development, several members of its team expressed interest in developing another game using the Infinity Engine. The development team was not made aware of Black Isle Studios' decision to develop Icewind Dale II until Torn's cancellation. Lead designer J. E. Sawyer described, "I don't know when the producers decided to make the game, but I was told that we were making the game when I learned that TORN was being cancelled ... on a Wednesday afternoon", and that Feargus Urquhart "asked me to work with Steve Bokkes to create a story and area overview by Thursday afternoon. Steve and I talked about it for the rest of the day. I went home that night and worked on the overviews until the next day. I came in and turned the docs in, and after the Friday division meeting, the project was in development." During this period, Interplay Entertainment relied on Black Isle Studios' games to alleviate financial trouble, which put pressure to release games quickly. The decision to develop Icewind Dale II was based partly on the original Icewind Dale's reception, and the development teams' ability to create a game with the Infinity Engine relatively quickly. Sawyer said of the decision, "In all honesty, the reasons for making Icewind Dale II have to do with limiting risks and maximizing our chances for a popular title." Conceptualization of Icewind Dale II progressed during the development of the Icewind Dale expansions, and production began late July 2001, shortly after the completion of Icewind Dale: Trials of the Luremaster. After six months of development, Icewind Dale II was officially announced on February 4, 2002. Icewind Dale II was originally planned to be an incomplete conversion to the D&D Third Edition ruleset, with many rules omitted. The kit system (class specialization) introduced in Baldur's Gate 2 was to be used, but this idea was later abandoned. Sawyer and several other members of the team pushed for the game's conversion to Third Edition. The development team was eventually granted an extension, which allowed them to complete the change to Third Edition rules. The Infinity Engine required extensive modification to comply with Third Edition rules, as it had originally been designed for Second Edition rules; certain elements of the rules were removed due to interface and engine issues. The game's interface was redesigned, and all-new art was created. It features new item icons, with new spell icons by Brian Menze; Menze had previously created Planescape: Torment's spell icons. Jason Manley, the portrait artist for the previous Icewind Dale games, left Black Isle Studios in late 2001; several new works he painted before his departure were later used in Icewind Dale II. Black Isle Studios artist Justin Sweet was asked to substitute. The game's resolution was increased to a minimum resolution of 800x600, with an unofficially supported maximum resolution of 2048x1536. J. E. Sawyer managed rule implementation, but the areas of the game were divided between designers. For example, designer Chris Avellone created the opening sequence, designer Dave Maldonado developed the Black Raven Monastery and a large area of wilderness, and designers John Deiley and Damien Foletto created the ending areas. Partway through development, Sawyer left the team to work as the lead designer on another internal project; Dave Maldonado and Chris Avellone were given his areas to finish. The developers wanted the game to contain more breaks from combat, with character interaction and puzzle solving, than the previous Icewind Dale. The decision to include more puzzles was influenced by the positive reception to the puzzles in Icewind Dale: Trials of the Luremaster. The game went gold on August 5, 2002, and was released on August 27. After the release of Icewind Dale II, Sawyer expressed dissatisfaction over the Icewind Dale series, saying that, "I wasn't particularly thrilled with how my work on [Icewind Dale] came out..." and, "...[Heart of Winter] managed to actually be worse than my Icewind Dale stuff." In regards to Icewind Dale II he said, "[It] came out better than I expected, but still, not exactly awe-inspiring." Chris Avellone later said, "Icewind Dale was a fun series, but it didn't try to set the bar for anything other than a fun romp. People may remember enjoying it, but it wasn’t trying to break any new ground or do anything revolutionary. In some respects, it was almost a step back from other games we'd done and focused more on exploration and dungeon crawls." A Collector's Edition containing bonus material, such as a full-color cloth map and soundtrack CD, was also released. Icewind Dale II was the final game developed using the Infinity Engine. The music of the game was composed by Inon Zur, whose previous works included Baldur's Gate 2: Throne of Bhaal and Fallout Tactics. Inon Zur worked with Jeremy Soule, the composer for Icewind Dale, to maintain the tone of the music. Inon Zur also worked closely with Interplay audio director Adam Levenson while composing the music; Zur and Levenson had worked together on several previous titles. Inon Zur said that while composing the theme for the game, "I wrote and rewrote the main theme several times", and "we tried to create a piece that would preserve the sound of the first Icewind Dale[...]we made great efforts to convey the new elements also. Capturing all of this in 30–45 seconds was not easy however I believe that we eventually found the right path for this game's soundtrack." Zur described the composing process, "After learning the storyboard and getting additional insight from the producers/music supervisor I'll start to compose. The thematic idea (main melody or rhythmical groove) comes first. Then comes the accompaniment followed by the orchestration," and that, "each piece should have its own unique flavour so every step is carefully examined. I have to make sure that the main idea of the piece is reflected in all these steps." He called the composing experience "very pleasant and rewarding." The music was composed in five weeks, and the recording and mixing lasted three weeks. As the game's music budget was low, a small Los Angeles orchestra was used to record the music; the sound of the each instrument was doubled during production. Inon Zur described the music as having "some uniqueness to it, that basically it developed throughout the game [with] the [inclusion] of more instruments, taking flutes and percussion and combining them with the standard orchestra." Zur later said, "I thought that we definitely met some high standards; we compared our products to big budget films scores," and, "in the end we were quite happy." The game features voice work from Gabrielle Carteris, Peter Stormare, and Grey DeLisle, among others. Icewind Dale II debuted at #6 on The NPD Group's weekly computer game sales chart for the August 25–31 period, at an average retail price of $45. The game rose to fourth place the following week, and exited the weekly top 10 in its third week. It was North America's 20th-best-selling computer game of August 2002 and 14th-best-selling of September. 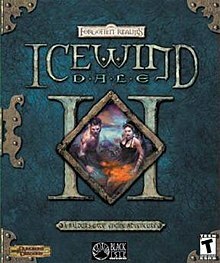 Icewind Dale II sold between 100,000 and 270,000 copies in the United States alone by August 2006. Combined sales of the Icewind Dale franchise reached 580,000 units in the country by that date. Icewind Dale II's reception was generally positive. Game Informer hailed it as, "one of the best RPGs ever released for the PC", and GameSpot called it, "simply a great role-playing game." However, PC Format said, "it's uninspired and uninspiring, giving itself a narrow remit and fulfilling that unspectacularly." Certain reviewers compared Icewind Dale II to Neverwinter Nights. IGN said, "[Compared to Neverwinter Nights] the pace of [Icewind Dale II] is more varied, its balance better, the gameplay more interesting," and Game Informer considered the interface superior to that of Neverwinter Nights. PC Format said, "in the light of Neverwinter Nights in particular, there's little that stands out in Icewind Dale II to recommend it," and PC Zone said, "it's not the [Baldur's Gate II: Shadows of Amn] killer we had all hoped for and neither does it stack up to Neverwinter Nights." Many reviewers praised the game's combat and pacing. G4 called the game's combat "sublime", and said that "no Infinity Engine game thus far has had such interesting and intricate tactical combat." GameSpot called it "expertly paced." PC Zone complained that certain gameplay mechanics had become outdated, but that "the only real downer is the antiquated spell system and the inexplicable necessity to rest after every fight." The game was also praised for its implementation of the Third Edition rules and interface. Computer Gaming World said that "[Icewind Dale II] has the Third Edition rules down, and in no other place in the game is it more apparent than with character development," and PC Gamer said it had "a dazzling implementation of the D&D 3rd Edition rules." GameSpot called the interface "a big improvement on the spread-out interface of all previous Infinity Engine games", and IGN said that "the customization improvements to the interface that seem so natural, they make you wonder why they weren't thought of before." Game Informer called the interface "absolutely inspired" and its inventory system "second to none." The game was criticized for its graphics and engine, which reviewers considered to be outdated. G4 called the engine "old" and "clunky", and PC Format said that "the whole thing is limited by the creaking engine." However, certain sources praised the engine. Game Informer called it "the best role-playing engine that has ever been invented", and GameSpot said that "'immortal' may be a better word to describe the engine, because the fact is, Icewind Dale II plays great." In regards to the graphics, GameSpot said that "in many ways Icewind Dale II represents the best use of the Infinity Engine's prerendered, isometric settings to date, [but] that doesn't change the fact that Icewind Dale II generally looks dated." IGN thought the sprites had become out-dated, and that "the animations are crude by today's standards." New Straits Times agreed, saying that although some of the effects were attractive, the "dated Infinity Engine" could not compare to contemporaries Dungeon Siege and Neverwinter Nights. However, Computer Gaming World believed that "it consistently offers the same striking and imaginative environments that establish the tone and immersive charm of the game", and Computer Games Magazine said, "it may not look like much, but it's got it where it counts." The game's pre-rendered backgrounds received praise. IGN said that "the artwork is attractive, both conceptually and in its final form", and Game Informer called them "beautiful". Many reviewers complained about the game's pathfinding AI, which PC Zone called "outrageously bad." Game Informer called the writing and story "on par with any fantasy novel." PC Gamer said it had "some of the richest and most enjoyable dialogue since Planescape Torment", and an "impressive storyline." GameSpot called the story "engrossing", and said that "the game is very well written, offering up a number of strong characters and serious themes." PC Zone noted that, "thanks to the excellent NPCs, the battles have a lot more meaning, as there is a strong storyline behind the endless hacking and slashing." PC Format thought that "Icewind Dale II also suffers, like its predecessor, from a story irrevocably weakened by anonymous central characters – the six you create." In regards to the audio, GameSpot said that "Inon Zur does a truly fantastic job that's perhaps even better than Soule's effort in the original Icewind Dale," and that "the voice acting in Icewind Dale II is as great as you've perhaps come to expect from a Black Isle Studios role-playing game." Computer Gaming World said that "[the] sound effects, music, and voiceovers are all excellent." Icewind Dale II was nominated for Computer Gaming World's 2002 "RPG of the Year" award, which ultimately went to The Elder Scrolls III: Morrowind. The editors wrote that Icewind Dale II "is the last great game from a fading engine, and we love it." It was also a nominee for PC Gamer US's "2002 Best Roleplaying Game" and The Electric Playground's "Best RPG for PC" awards, but lost both to Neverwinter Nights. Allen Rausch, writing for GameSpy's 2004 retrospective "A History of D&D Video Games", "While nobody would mistake it for '2002 RPG of the Year' material, Black Isle Studios managed to give the Infinity engine a terrific game as its swan song." While other Black Isle games, including Baldur's Gate and Icewind Dale, have been remade into Enhanced Editions by Beamdog, such as Icewind Dale: Enhanced Edition, Beamdog had unsuccessfully tried to do the same for Icewind Dale II due to the unavailability of the source code to the game; the project is on hiatus until the source code can be located. ^ a b c d e f g h i j Avellone, Chris; Greene, Michael (2002). Icewind Dale II Instruction Manual. Interplay Entertainment. ^ Foletto, Damien (March 1, 2002). "Icewind Dale II Designer Diary #2". RPG Vault. Archived from the original on December 16, 2009. Retrieved August 13, 2009. ^ a b c Bub, Andrew (May 1, 2002). "Urquhart of Winter". GameSpy. Archived from the original on June 1, 2002. Retrieved August 24, 2009. ^ Butts, Steve (July 16, 2002). "Icewind Dale II Hands-on". IGN. Archived from the original on April 20, 2012. Retrieved August 13, 2009. ^ Avellone, Chris (May 10, 2002). "Icewind Dale II Designer Diary #7". RPG Vault. Archived from the original on February 22, 2007. Retrieved August 13, 2009. ^ a b Butts, Steve (March 15, 2002). "Icewind Dale 2 Trailer and Interview". IGN. Archived from the original on August 12, 2011. Retrieved August 13, 2009. ^ a b c d e f g Aihoshi, Richard (February 4, 2002). "Icewind Dale II Interview". RPG Vault. Archived from the original on August 31, 2002. Retrieved September 15, 2009. ^ Black Isle Studios (2002). Icewind Dale II. Interplay Entertainment. Journal: Speaking with Sherincal further we discovered that this Legion of the Chimera is an organization composed of the disenfranchised freaks of Faerûn. ^ Black Isle Studios (2002). Icewind Dale II. Interplay Entertainment. Journal: The ranger Braston believes that Sherincal, the one we overheard talking to Guthma, could be further directing the horde. ^ Black Isle Studios (2002). Icewind Dale II. Interplay Entertainment. Journal: We will follow the Black Raven River north to where it flows from the Spine of the World mountains. There should be a network of caves there that leads to a monastery high in the mountains. Beneath the monastery is an entrance to the Underdark. From there we'll enter the ancient dwarven ruins of Dorn's Deep from below. From there we can surface on the northern side of the Spine of the World. ^ Black Isle Studios (2002). Icewind Dale II. Interplay Entertainment. Narrator: What an odd sight the Black Raven Monastery must have been to those adventurers. While Uncle Oswald and Nathaniel evacuated Kuldahar to the north and east, the sell-swords from Targos happened across that strange place. To this day, I can't claim to understand the monks or their philosophy. Iselore himself spoke of their order in confused tones, as if his druidic order and the monastic order were so close – and yet so different – that they became totally foreign to his understanding. ^ a b c "Icewind Dale 2 Interview with Doug Avery". Sorcerer's Place. April 4, 2002. Retrieved August 24, 2009. ^ Aihoshi, Richard (August 3, 2000). "Icewind Dale Special Report". RPG Vault. Archived from the original on July 26, 2008. Retrieved September 15, 2009. ^ a b Black Isle Studios (2002). Icewind Dale II. Interplay Entertainment. Journal: We were unsuccessful in our attempt to bluff our way past the Guard Commander in front of the Severed Hand entrance. However, she did let slip that the Minister of Foreign Affairs, Xavier Torsend, has the power to hand out delegate passes. Perhaps he would be a good person to see first, once we get inside. ^ Avellone, Chris (April 26, 2002). "Icewind Dale II Designer Diary #6". RPG Vault. Archived from the original on March 2, 2008. Retrieved September 15, 2009. ^ Black Isle Studios (2002). Icewind Dale II. Interplay Entertainment. Journal: Through research Nheero discovered that a large force of yuan-ti are living in Dragon's Eye – many of them practitioners of the arcane arts. ^ a b c Lafferty, Michael (September 19, 2002). "Journey into the world of Icewind Dale II with Josh Sawyer". GameZone. Archived from the original on June 10, 2009. Retrieved August 23, 2009. ^ O'Connell, Michael (April 23, 2002). "Icewind Dale II Intelligence Report". RPG Vault. Archived from the original on October 8, 2008. Retrieved September 15, 2009. ^ Black Isle Studios (2002). Icewind Dale II. Interplay Entertainment. Journal: Lord Ulbrec has officially welcomed us into the Targos Guard, and he has told us to report to the commander of the Targos Guard, Shawford Crale, for our assignments. Ulbrec told us we could find Crale at the Palisade, just beyond the north gate. ^ Black Isle Studios (2002). Icewind Dale II. Interplay Entertainment. Journal: We told Shawford that we'd pressured the Iron Collar band to get their worthless hides onto the Palisade, and he seemed surprised and grateful at our efforts. No sooner had he finished congratulating us when we heard an explosion from outside, and the Palisade was under attack![.. ]With aid from the Targos Guard, we managed to turn back the goblin attack on Targos and slaughter the goblin leaders. We should tell Shawford or Ulbrec of our success. ^ Black Isle Studios (2002). Icewind Dale II. Interplay Entertainment. Journal: Lord Ulbrec praised us for our efforts in defending Targos during the goblin attack on the Palisade, but with his praise came another mission: a goblin force has taken the Shaengarne Bridge to the south, a bridge that the Neverwinter reinforcements intended to use to reach Targos. He wants us to travel to Shaengarne Bridge and retake it from the goblinoids. He hopes our band can succeed where the Targos Guard cannot; only time will prove him right or wrong. / [...] Lord Ulbrec heard of the destruction of Shaengarne Bridge, and he has determined that only if Targos can mount an offensive quickly can Targos hope to break the goblin horde before they strike the town again. He has asked us to meet two of his scouts, Ennelia and Braston, south and east of Targos and give them whatever aid they require to break the goblins' strength in the region. ^ Black Isle Studios (2002). Icewind Dale II. Interplay Entertainment. Journal: We have met the ranger Braston in the bowels of the Horde Fortress. He informed us that the leader of the horde is one called Guthma. Our killing of Guthma should disrupt the horde and provide the relief that Targos and the Ten-Towns require. / [...] The ranger Braston believes that Sherincal, the one we overheard talking to Guthma, could be further directing the horde. However, he was quick to point out that even if this Sherincal was directing Guthma, our removal of Guthma should be enough to stop the attacks on Targos. / [...] After defeating Guthma, Ennelia has reported that the horde army is already starting to fall apart. She congratulated us on our victory and noted that our attack has crippled any further offenses against the Ten-Towns. ^ Black Isle Studios (2002). Icewind Dale II. Interplay Entertainment. Journal: Lord Ulbrec heard of our success in infiltrating the horde fortress and defeating the bugbear chieftain, Guthma. He thanked us for our efforts and gave us our next mission, which should prove somewhat less strenuous than the other suicide missions we've already taken. He asked us to speak to Oswald Fiddlebender and have him ferry us to the Western Pass to rendezvous with the reinforcements from Neverwinter. ^ Black Isle Studios (2002). Icewind Dale II. Interplay Entertainment. Journal: Traveling in Oswald's airship to the Western Pass to find and meet with the military expedition from Neverwinter, we noticed a glacier blocking a large section of the pass. We were immediately caught in a sudden ice storm that seemed to come from within the glacier, and crashed in the foothills that sit at the base of the Spine of the World Mountains. We should investigate that very unusual glacier. ^ Black Isle Studios (2002). Icewind Dale II. Interplay Entertainment. Journal: We met Sherincal, a towering, female half-blue-dragon guarding the entrance to the Aurilite ice temple. She claimed to lead the forces of something called the "Legion of the Chimera" in Icewind Dale's western region. It appears the strange banners we've been seeing belong to them. / [...] We also learned from Sherincal that Isair and Madae are twins who rule the Legion of the Chimera from its capitol, the Severed Hand. ^ a b Black Isle Studios (2002). Icewind Dale II. Interplay Entertainment. Journal: Xavier told us that the war was caused by Betran Weaver, the mayor of Bryn Shander, and his advisor Cardaf, a priest of Helm. It seems that they sent Isair and Madae cakes made with holy water, knowing that the twins were cambions and would come to harm when they ate them. An act of stupidity that has cost many their lives. ^ Black Isle Studios (2002). Icewind Dale II. Interplay Entertainment. Journal: We met Nathaniel, a druid from Kuldahar, who'd been locked in one of the ice temple's prison cells. He asked us to free him before he suffered the same fate as his fellow prisoners, whatever that may be. ^ a b Black Isle Studios (2002). Icewind Dale II. Interplay Entertainment. Journal: With the Aurilites no longer posing a threat, all that remained was to destroy enough of the glacier they created to open the Western Pass. Nathaniel left to check on Oswald and fly to the Ten-Towns to warn them, promising to meet us in Kuldahar. He asked us to use the fissure he would create to head south around the Spine of the World Mountains on foot, take the unguarded Eastern Pass to Kuldahar, and warn them about the collusion between the Aurilites and the Legion of the Chimera. ^ Black Isle Studios (2002). Icewind Dale II. Interplay Entertainment. Journal: We delivered Denham's trapped replacement for Garradun the spy's false love-letter to Captain Ingrath Mariner. We also gave Denham's note of warning to Sergeant Rahm Dammel, the commander of the Luskan forces. ^ Black Isle Studios (2002). Icewind Dale II. Interplay Entertainment. Journal: We met a drow merchant named Nym in a small village. He was waiting there for the military expedition from Neverwinter – the same one destroyed by the Aurilites at the glacier in the Western Pass – to arrive. / [...] The drow merchant Nym told us that the Eastern Pass was entirely blocked by troops of the Legion of the Chimera. However, he explained that there was another route over the Spine of the World: through the Underdark. We will follow the Black Raven River north to where it flows from the Spine of the World mountains. There should be a network of caves there that leads to a monastery high in the mountains. Beneath the monastery is an entrance to the Underdark. From there we'll enter the ancient dwarven ruins of Dorn's Deep from below. From there we can surface on the northern side of the Spine of the World. ^ Black Isle Studios (2002). Icewind Dale II. Interplay Entertainment. Journal: Isair and Madae, twin commanders of the Legion of the Chimera, appeared before us in the Wandering Village. They claim to have found us with information purchased from Nym, the drow merchant who told us of the underdark passage beneath the Black Raven Monastery. Madae claimed that the Legion would still attack Kuldahar, and Isair warned us to stop our "meddling," claiming that Targos wasn't alone in having Luskan allies. To demonstrate his seriousness, Isair slew several villagers and raised them as zombies against us before vanishing along with his sister. ^ Black Isle Studios (2002). Icewind Dale II. Interplay Entertainment. Journal: The drow merchant Nym told us that the Eastern Pass was entirely blocked by troops of the Legion of the Chimera. However, he explained that there was another route over the Spine of the World: through the Underdark. We will follow the Black Raven River north to where it flows from the Spine of the World mountains. There should be a network of caves there that leads to a monastery high in the mountains. Beneath the monastery is an entrance to the Underdark. From there we'll enter the ancient dwarven ruins of Dorn's Deep from below. From there we can surface on the northern side of the Spine of the World. ^ Black Isle Studios (2002). Icewind Dale II. Interplay Entertainment. Narrator: At long last, my uncle brought the adventurers to Kuldahar. ^ Black Isle Studios (2002). Icewind Dale II. Interplay Entertainment. Journal: As soon as we had landed in Kuldahar, we were greeted by an emissary of the Legion of the Chimera, a neo-orog priest of Bane called Hiepherus. He claims all of Kuldahar for his own, and he has raised undead monsters to seal off Kuldahar Pass. ^ Black Isle Studios (2002). Icewind Dale II. Interplay Entertainment. Journal: The Archdruid of Kuldahar, Iselore, asked us to help stop an impending threat to the village and its great oak. He believes that yuan-ti from Dragon's Eye have opened a magical "crossroad" to a jungle in Chult, far to the south. He asked that we find a way to seal the portal from the other side. This involves slaying the "guardian" of the crossroads. Iselore believes that the yuan-ti are probably protecting the guardian to insure that this does not happen. ^ Black Isle Studios (2002). Icewind Dale II. Interplay Entertainment. Journal: We have broken the strength of the yuan-ti at the temple in Chult. This should prevent them from reinforcing the yuan-ti at Kuldahar. ^ Black Isle Studios (2002). Icewind Dale II. Interplay Entertainment. Journal: Iselore told us that the Legion of the Chimera forces are using Dragon's Eye as a route to Kuldahar. He believes that at the base of the Dragon's Eye volcano, we will be able to enter the Fields of Slaughter. From there, we can access the Severed Hand. ^ Black Isle Studios (2002). Icewind Dale II. Interplay Entertainment. Journal: A man named Nheero Fhutma was held in a yuan-ti prison on the first level of Dragon's Eye. We agreed to find a way to open the prison's gate. ^ Black Isle Studios (2002). Icewind Dale II. Interplay Entertainment. Journal: Orrick has completed his investigation into the mythal corruption. He has found that the mythal has activated and bound itself to the plane of limbo. He speculates that it is going to shift the Severed Hand onto that plane. He has warned us to be prepared to flee for our lives at a moment's notice. ^ a b c d "Icewind Dale II Q&A". GameSpot. February 4, 2002. Retrieved August 18, 2009. ^ Rice, Kevin (March 22, 2001). "Torn preview". Daily Radar. Archived from the original on August 4, 2001. Retrieved August 18, 2009. ^ a b c d e "Icewind Dale II Interview". RPGDot. June 11, 2002. Archived from the original on October 12, 2002. Retrieved August 18, 2009. ^ a b c d Maldonado, Dave (February 15, 2002). "Icewind Dale II Designer Diary #1". RPG Vault. Archived from the original on December 21, 2009. Retrieved August 18, 2009. ^ a b c "Press Releases". Archived from the original on April 9, 2004. Retrieved September 15, 2009. ^ a b Maldonado, Dave (March 15, 2002). "Icewind Dale II Designer Diary #3". RPG Vault. Archived from the original on December 5, 2006. Retrieved August 23, 2009. ^ Deiley, John (April 12, 2002). "Icewind Dale II Designer Diary #5". RPG Vault. Archived from the original on August 4, 2009. Retrieved August 24, 2009. ^ "Icewind Dale II Q&A". The Armchair Empire. March 14, 2002. Retrieved August 13, 2009. ^ Sawyer, Josh (December 16, 2002). "I thought I could organize freedom. How Scandinavian of me". RPG Codex. Retrieved August 23, 2009. ^ "Chris Avellone: Dark Knight". Edge. April 21, 2009. Retrieved August 23, 2009. ^ a b c d e f g h Kasavin, Greg (September 6, 2002). "Icewind Dale II Review for PC". GameSpot. Retrieved September 2, 2009. ^ a b Ladewig, Bruce (October 11, 2002). "Inon Zur Interview". RPGPlanet. Archived from the original on March 15, 2013. Retrieved August 27, 2009. ^ a b McCarroll, John (December 2, 2002). "Inon Zur Interview". RPGFan. Retrieved August 27, 2009. ^ "Inon Zur: Videogame Music Composer". Game Daily. Archived from the original on June 26, 2003. Retrieved August 27, 2009. ^ Calvert, Justin (September 12, 2002). "Madden backs off". GameSpot. Archived from the original on October 5, 2003. ^ Calvert, Justin (September 19, 2002). "Warcraft III slips from the top spot". GameSpot. Archived from the original on April 17, 2004. ^ a b Calvert, Justin (September 26, 2002). "Battlefield 1942 shoots to the top". GameSpot. Archived from the original on April 17, 2004. ^ Calvert, Justin (October 24, 2002). "The Sims: Unleashed dominates September charts". GameSpot. Archived from the original on February 18, 2004. ^ "Icewind Dale II for PC". GameRankings. CBS Interactive. Retrieved October 15, 2018. ^ "Icewind Dale II for PC Reviews". Metacritic. CBS Interactive. Retrieved October 15, 2018. ^ a b Bub, Andrew (November 2002). "Once more unto the Dale dear friends!". Computer Games Magazine: 80. ^ a b c d Staff (December 2002). "Icewind Dale II". Computer Gaming World (221): 116. ^ a b c d Hayne, Sam (September 27, 2002). "'Icewind Dale II' (PC) Review". G4. Archived from the original on October 15, 2002. Retrieved September 3, 2009. ^ a b c d e f g h Brogger, Kristian (October 2002). "Icewind Dale II". Game Informer (114): 92. ^ a b c d e f Brenesal, Berry (September 5, 2002). "Icewind Dale II Review". IGN. Retrieved September 2, 2009. ^ a b c d e Atherton, Ross (October 2002). "Icewind Dale II". PC Format (140). ^ a b c Peckham, Matthew (October 2002). "Icewind Dale II". PC Gamer: 87. ^ a b c d e Anderson, Chris (September 12, 2002). "Icewind Dale II Review". PC Zone. Archived from the original on May 4, 2011. Retrieved September 12, 2009. ^ Staff (April 2003). "Computer Gaming World's 2002 Games of the Year". Computer Gaming World (225): 83–86, 88, 89, 92–97. ^ Staff. "Blister Awards 2002". The Electric Playground. Archived from the original on March 8, 2003. ^ Smith, Rob (March 2003). "The Ninth Annual PC Gamer Awards". PC Gamer US. 10 (3): 48–50, 54, 58, 60, 66, 68, 70. ^ Schreier, Jason (July 7, 2017). "Nobody Can Find The Source Code For Icewind Dale II". Kotaku. Retrieved July 11, 2017. 1 Fallout was released prior to the studio's official naming.